Revlon Kiss Balm as Low as FREE at CVS! Woot! Here is another awesome deal you can score at CVS this week! 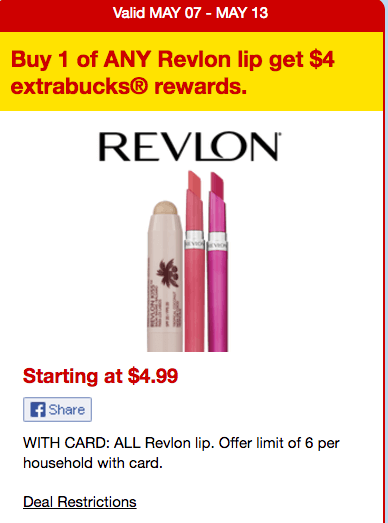 Through 5/13, CVS is offering a $4 ECB when you buy any Revlon Lip Product. The limit on this offer is 6 and these are priced staring at $4.99. We have no coupons available for these, but many CVS Shoppers are getting at $3 off Revlon Cosmetics Coupon printing at the CVS Coupon machine, if you have this coupon you can score this FREE + $2.01 money maker! Be sure to check out the rest of the CVS Deals for the week before you shop. New Coupon! Xtra Laundry Detergent Just $0.49 at ShopRite ! D on New $0.50/1 Energizer Batteries Coupon – 4 Better Than FREE at ShopRite & More!